SuiteTake.com - Post Production Technology, Reviews, Experiences & Opinion from the Edit Suite. I knew I would be taking the summer off to spend with the kids. 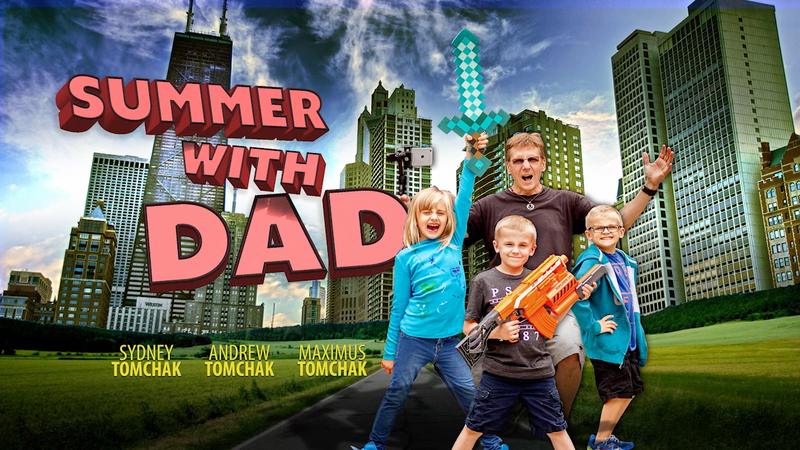 While I was probably over ambitious at the onset about what activities we would do over the summer, one thing I knew for sure was that I wanted to do a video with them. It’s something I’ve been thinking about almost since the moment they were born. Not only would it give them something to enjoy and relive for years to come, it would keep me practiced and allow me to push a few boundaries for myself. It was also a good test of how far you could push an iPhone when all you have is an iPhone. I was both pleased and disappointed with my iPhone only experience. More on that later. So with a loose plan, iPhone 6s Plus and plenty of time on our hands, we set out to make a summer music video. Here are some of the BTS details and lessons learned. For over 20 years I’ve been making my living off of the profession of editing video. 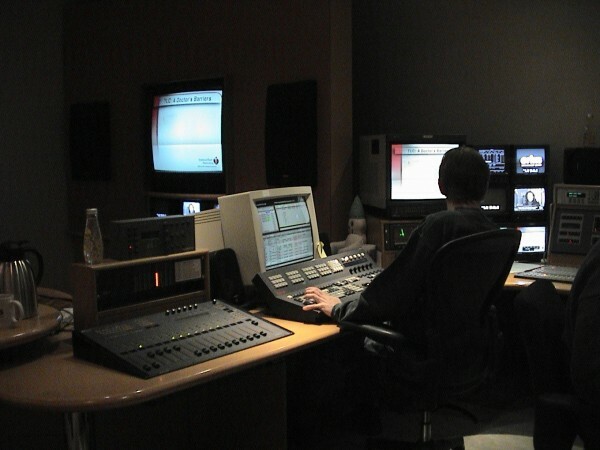 When you edit 40–50 hours a week on a regular basis you really hone your craft and over time find a balance between getting the job done on time and making it look as great as possible. There was a period of time in my career that I wanted to create everything myself. I looked down on using templates or prebuilt backgrounds because in my opinion I was good enough to make all of that from scratch and didn’t want to feel like I was leaning on the creativity of others. The same could be said for plug-ins. It’s easy to get lost in all of the “cool things” that you can do with plug-ins and sometimes lose sight of the story you’re trying to tell. It’s easy to over do it. I’ve see editors try to find a reason to use a cool effect they like even though it doesn’t really fit the mood of their story or project. I never wanted to fall into that. But what I have learned is that even if I can make something myself, what’s the point if I can do something more efficiently and in the end have a better product for the client? Is it more important to turn out a good product, or have my ego hold me back from creating better work just because I wanted to do it all myself? What I have found over the years is it’s not a either/or situation. I’ve also come to think that it often makes great sense to use these tools to your advantage – because in the end what I really want is the best product possible. It can also free up time to focus on other parts of the project that really could benefit from your talents. 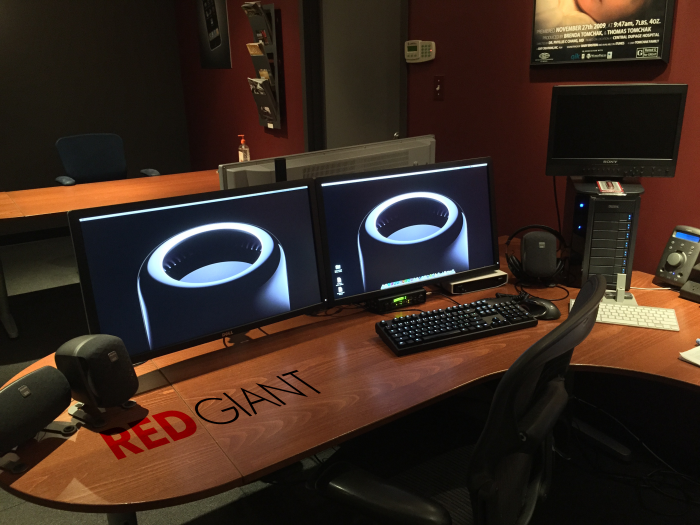 So in that light, what follows is my review of Red Giants Magic Looks Suite 12. It’s a collect of plug-ins designed to make it fast and easy to bring the best out of your footage. I’ve been using it extensively for years, but recently upgraded to the version 12 suite and have been testing it on both FCPx and Premiere Pro CC/After Effects and wanted to share my impressions of it. The comments that follow apply to any host application that you choose to use them in, not just FCPx or Premiere. The suite is very rich in what it offers and I can’t cover every detail of every plug-in in the package, but I will share my experiences on some of my favorite parts of the suite. As it turns out, the internet is a great way to restart communications when it seems to be all but broken down. 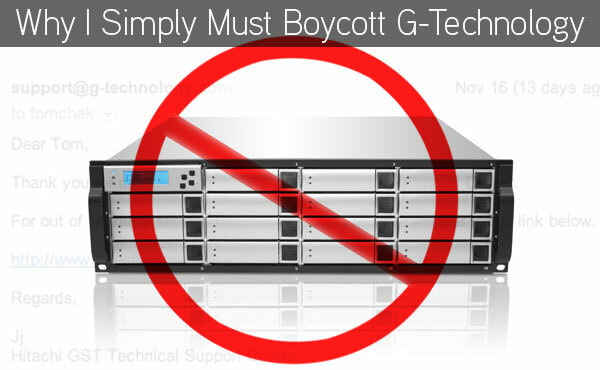 Less than 24 hours after my “Boycott G-Tech” post on SuiteTake.com, I received several calls from executives at both G-Technology as well as Hitachi. The calls came in while I was editing so they went to voice mail, but when I had a chance to finally call one of them back I was pleasantly surprised that the tone of the conversation was very constructive and apologetic. At this point I’ve had a few phone calls with Todd Etherton, who is the Director of World Wide Customer Support at Hitachi. The very first thing he said was that they were very sorry for the experience that I had with their tech support team, and that they agreed that something needed to be changed. We talked for about 10 minutes and then I asked him to call me back when they had a plan actually in place so that I could talk about it on the blog (instead of speculate about what they might do). The next morning (still less than 48 hours since my post hit) I get another call (again while I’m editing) and I call him back in the evening on my way home. 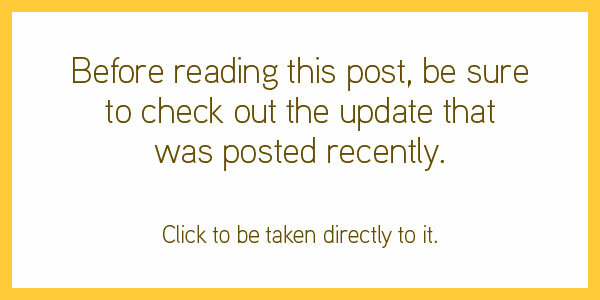 Todd tells me that in response to my blog post, they have made a few significant changes that will alleviate a repeat experience like the one that I had. While G-Technology has been one of my most favored and most recommended companies for well built, professional hard drives, due to a recent experience I can no longer lend my support to the company. From the mid-2000’s G-Technology has been a leader in high quality products and service. I built my first home edit system on a stack of G-Raid drives because they not only made a solid product, but they were focused on the video pro. They didn’t just talk about data rates and drive speeds, they broke it down into editing lingo – the number of real time streams you could expect – and they guaranteed it. At one point I had some issues with some G-Raid drives that I had purchased, and they were always very fast to respond and in one case pre-shipped me a replacement drive even before I had sent them back the problem drive. For me personally, a really sold product means nothing if the company does not stand behind it with good people and exceptional customer service. And that’s where my relationship has now changed. In February 2009 G-Tech was acquired (indirectly through Fabrik) by Hitachi. At the time I thought this was great, because for a long time Hitachi drives have been the best in class, and the most reliable drives on the market. So it seemed like a good idea. But now, two years later it appears this change in ownership has translated into terrible customer service, especially if your warranty has run out. 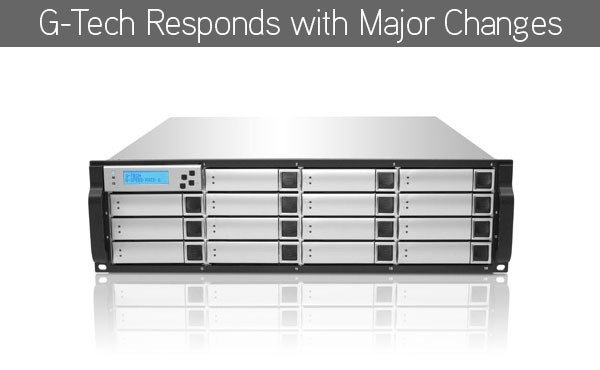 Over the last 5 years I have spent over $25,000 on two maxed out G-Speed XL systems (around 25TB of combined space). We’re not talking about little desktop drives, we’re taking about making a serious investment in a company, especially for a small boutique post house. I was a very early adopter of the very first units they shipped in January 2007 and even did a post on SuiteTake and The Creative Cow about my experience with the drive. I was very happy with it, and just over 3 years ago purchased a second one for the other edit room. Based on my experience with the company over the years I had no worries. A funny thing happened a couple of weeks ago, however. The power supply in the newer drive system went bad and as it’s supposed to, was beeping pretty loud to get the attention of anybody within 20 feet. No big deal, things happen and after all it’s the reason why it’s built with a backup power supply. The drive was still running smoothly, but no longer with a safety net. I filled out the on-line tech support form at G-Technology like I’ve done in the past, and a day later (mind you this is a serious problem) I get a email telling me that my unit is out of warranty. Figures, it’s always just after it expires that something goes wrong. The product that I’m reviewing this time is the “Edit Bay Production Desktop” software and hardware package from the Tolis Group. It has turned out to be quite the winner, and I’m excited to share our experience with it. While they do offer several different solutions of hardware/software or software only solutions (you provide the hardware), I’m going to focus on this one all in one package. It’s my feeling that this is the best fit for the small to medium sized post house with 1-5 workstations. To see some of their offerings, check out their website. What I liked about the “Edit Bay Production Desktop” package right from the onset was that it was a complete solution for your Mac. You provide a G5 tower, Xserve or MacPro computer with a open PCIe slot (must be a 8x slot), and they provide you with everything else. 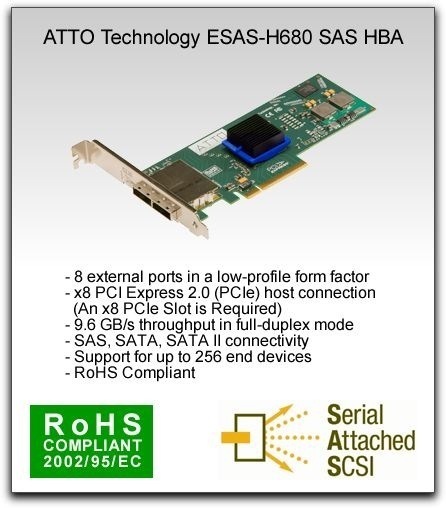 In your open PCIe slot you will install a SAS host bus adaptor. 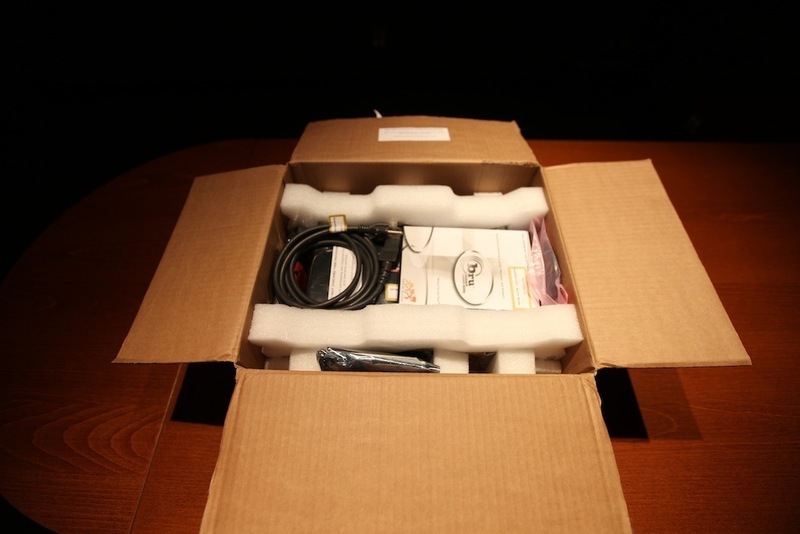 The card they provide is the ATTO ExpressSAS H680, and it was as easy to install as a video card. It’s as simple as removing the side panel of your tower and adding the card to your open slot. Once booted up, you install a driver for the ATTO card from the included CD, reboot again and the card is ready for use. After that, turn the machine off and attach the LTO drive. 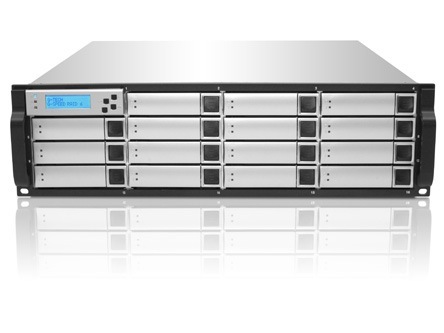 Depending on the package that you choose, you will receive either a LTO-4 or LTO-5 drive. Both are HP drives in a external case. 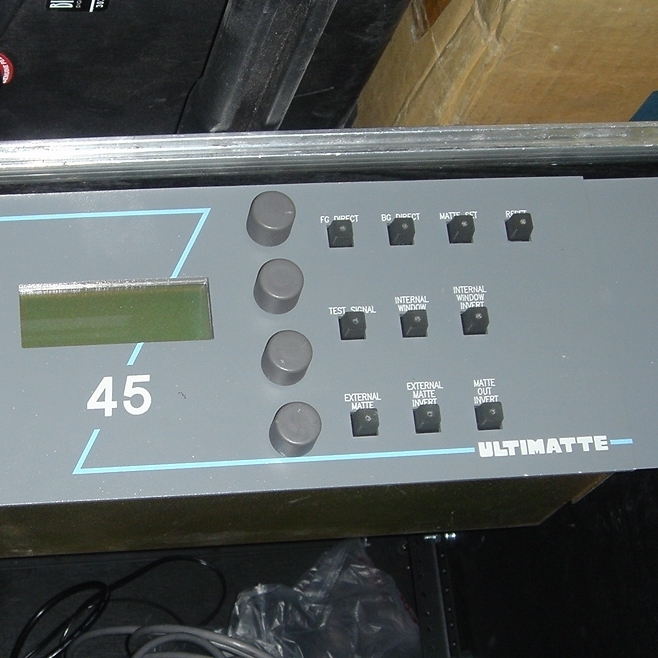 We have the LTO-5 drive. 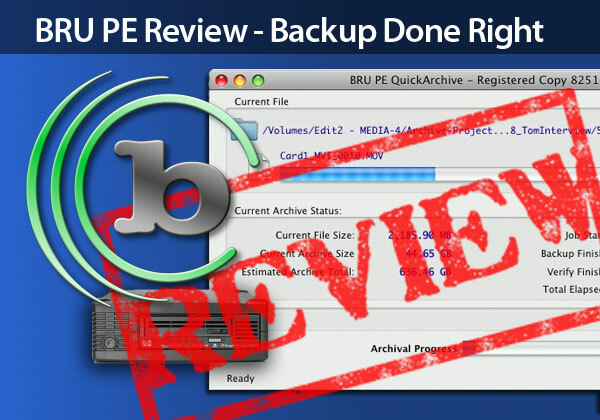 With the LTO drive attached and the machine booted up, install the BRU Producer Edition software (from here on referred to as BRU PE) . 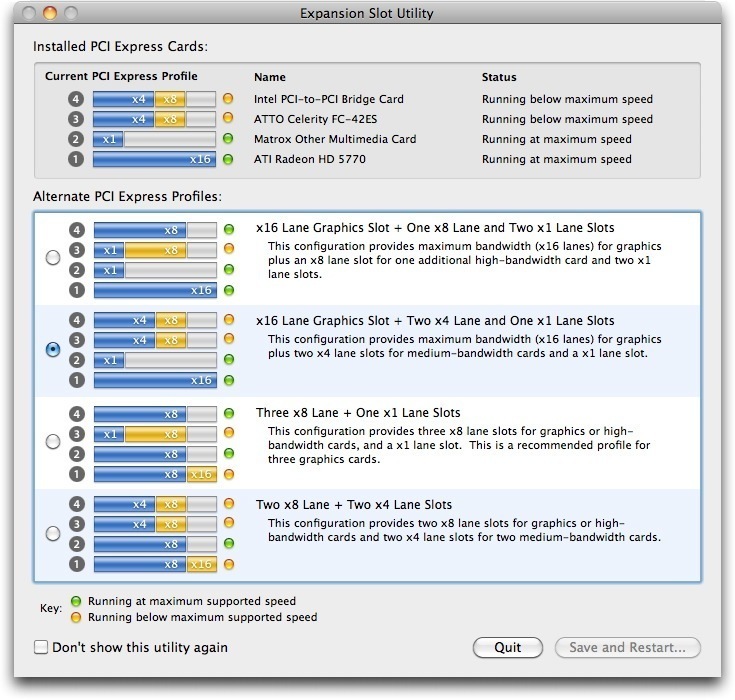 This is really the heart of the product and is written for OSX specifically. Installation is as easy as mounting the included CD ROM or downloaded .dmg disk image and running the installer. Now you’re ready to start. 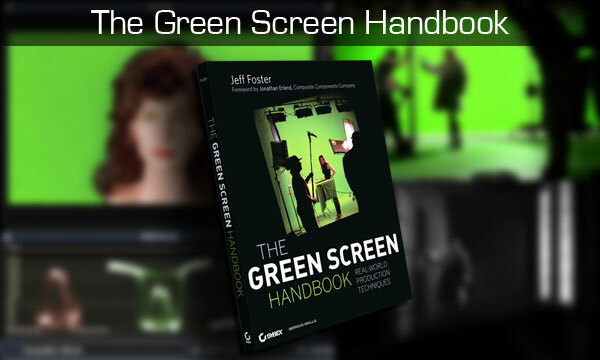 While I wouldn’t necessarily refer to myself is a “Green Screen Guru”, I have my share of experience with pulling color based keys. For me is started on a Grass Valley 200 switcher in the late 80’s with the little spinning knobs you used to select and finesse the color. I remember that little chirping sound it would make as you went from one limit to the other. 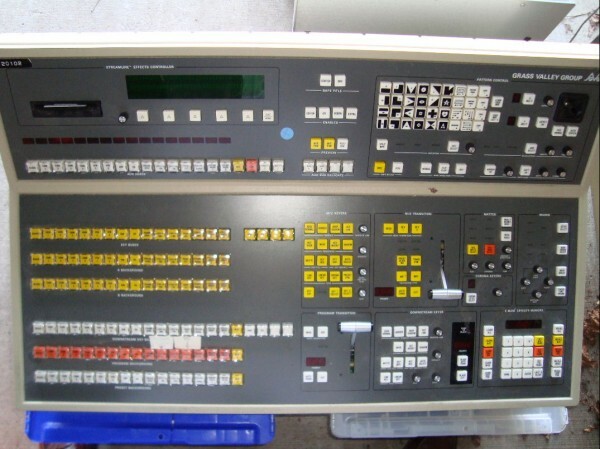 Just thinking about that switcher really takes me back. In later years I worked with a Ultimatte 45 external hardware box that allowed you to pull great keys using a component signal. At the time it was a $35k box and the place I was working at would only rent it when we had a project that required it. Sometimes I would run it as part of a studio shoot to check keys as we went, but most of the time it was setup in the online suite I was in. The difficult part about using this box was that the first few times I used it I only had a few short hours to actually learn the box. As soon as it showed up I would pull out the manual and start reading so that I could at least appear to the client that I knew what I was doing! Years later we have tools that are so much more powerful right on our computers, and they cost a small fraction of what the original Ultimatte did, or in some cases come free with editing and compositing software. FCP Studio has some ok keyers included, but Primatte inside of Motion is actually pretty good. And AfterEffects has KeyLight, which I find to be the best blue/green screen keyer out there for what I do. It’s rare that I can’t get a good key out of keylight regardless what I throw at it.